The Traulsen UHT48-LR undercounter refrigerator has a self-contained refrigeration system where all of the components are together so servicing the fridge is easier. Since this unit is front breathing, it easily fits in compact spaces with no need for side clearance. The equipment holds temperatures within a range of 34 to 38 degrees Fahrenheit. A thermometer is mounted inside the fridge so operators can keep an eye on food temperatures. The defrost system and condensate evaporator run automatically to ensure the fridge is always running efficiently. 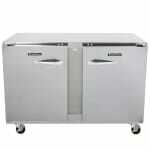 Four 4-inch casters make the fridge movable so cleaning beneath it is easy. The stainless steel exterior is easy to clean and heavy-duty for commercial use. The interior is made from anodized aluminum that resists corrosion; four powder-coated shelves are adjustable in 1⁄2-inch increments and hold all the products you want to store. 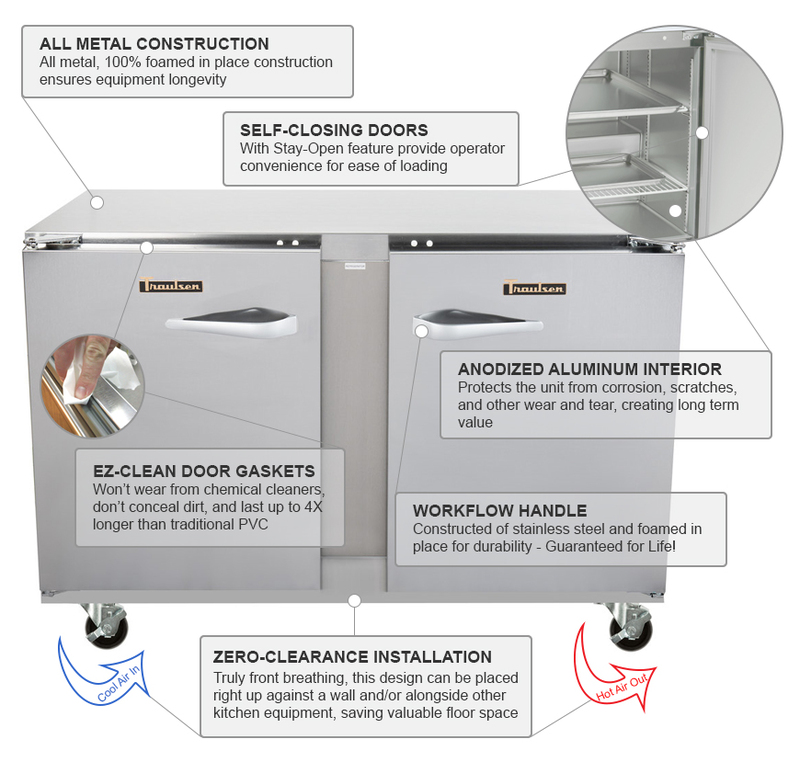 There are two solid doors that are made from stainless steel; the doors are self-closing at 90 degrees and stay open at 105 degrees for easy loading. 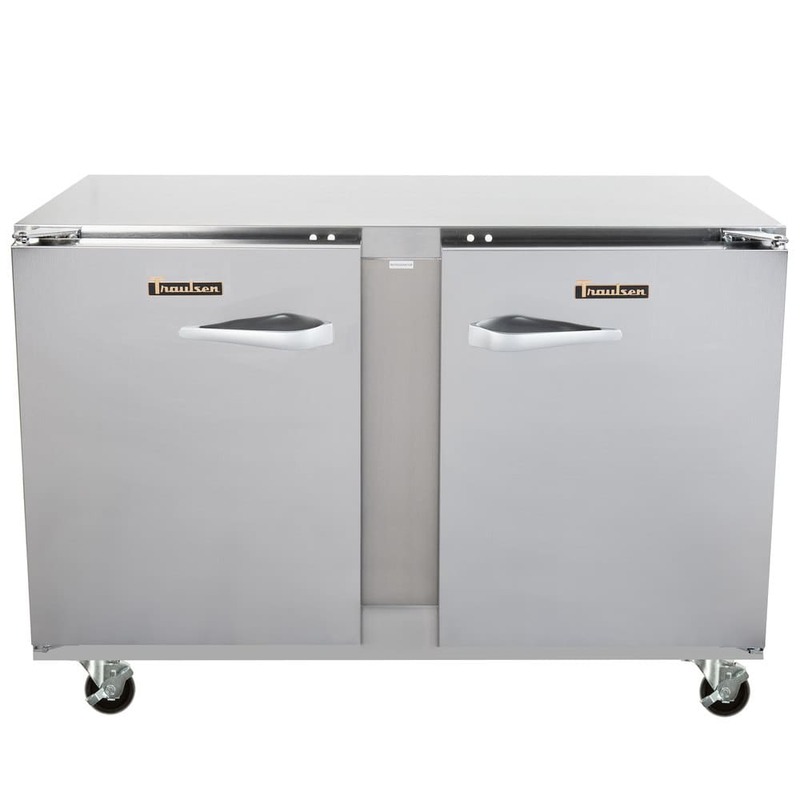 The Traulsen UHT48-LR undercounter refrigerator is fully insulated with foamed-in-place polyurethane to retain cold air.